At the same time, a misfortune happened, for the painter just a murderous one, Repin’s right hand refused, because of which he had to relearn himself to paint. Note that at this time Repin lived quite alone, he did not visit his friends and did not participate in exhibitions, despite the fact that the artist’s estate was located in general, not far from the capital. It should be noted that Repin was destined to live in Penaty until the end of his days. As a result of subsequent turbulent events, Finland separated from Russia, which has now become Soviet. 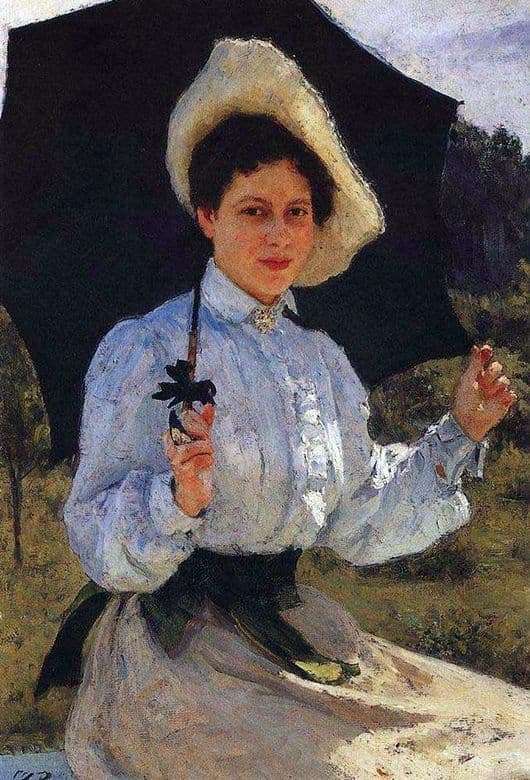 The appearance of the portrait of Nadezhda Repina, the daughter of a great artist, also dates back to this period. The tonality of the picture is extraordinarily bright and peaceful: the girl, walking in the park, decided to hide from the hot day under an umbrella. She is dressed in the fashion of the last century: in a white blouse, which is decorated with a brooch, and a skirt with a wide belt. On her head a cap. The woman’s face is extremely calm and peaceful, and only the bumblebee, which has appeared from nowhere, can break this idyll. Note that until the end of his life Repin remained a realist. Despite the fact that he continued to write at the turn of the century, in his work there are no examples of impressionistic and symbolist experiments like “The Demon” by Vrubel and “Poppies in Arzhantey” by K. Monet. However, this did not prevent Repin from creating psychologically very accurate and “living” pictures. This applies fully to the canvas “In the Sun”. It seems a few more moments – and we will feel the heat of the midday day, we will feel the attracting smell of herbs and flowers, and somewhere nearby we will hear the buzz of a bumblebee flying toward us.